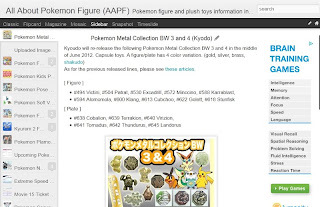 Here is list for upcoming Keldeo items in April 2012. 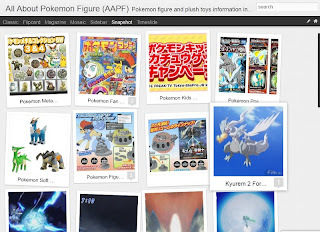 As for other items, please see below PokeCenJP official page. 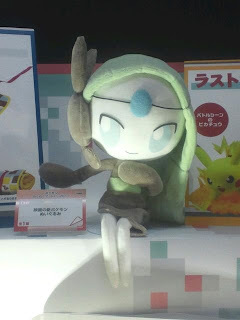 PokeCenJP will release the following Pokedoll plush on 28 April 2012. Ensky will release the following Jigsaw puzzle in April 2012. As for other jigsaw puzzle, please see these articles. 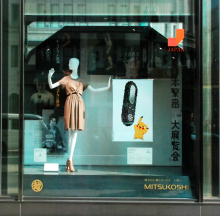 Major department store Isetan will be held the charity advertisement exhibition for Tohoku region disaster, start 4 April to 9 April 2012 at Shinjyuku-branch, Tokyo Japan. 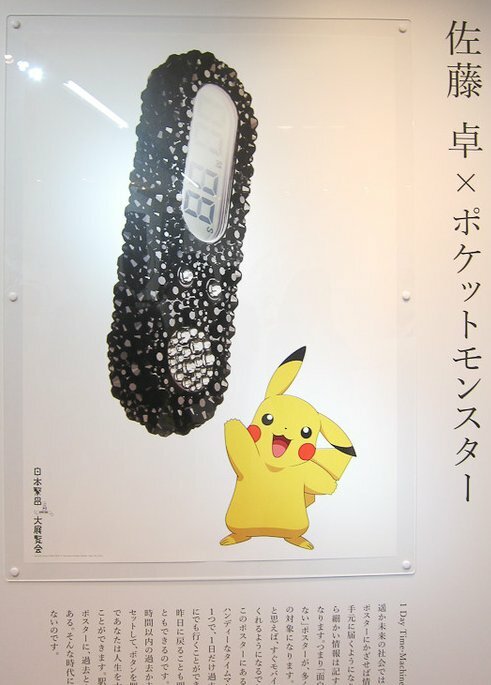 One of theme in the exhibition is 'feature advertiosemnt', it is based on assumption that promotion in after 10 or 20 years in Japan. 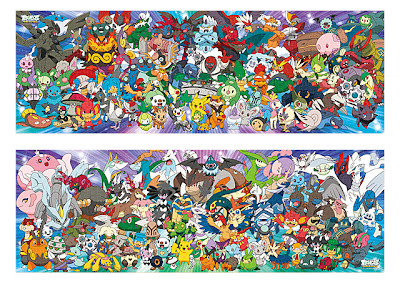 Pokemon's poster collaboration with graphic designer Taku SATO as known as package designing will be displayed. 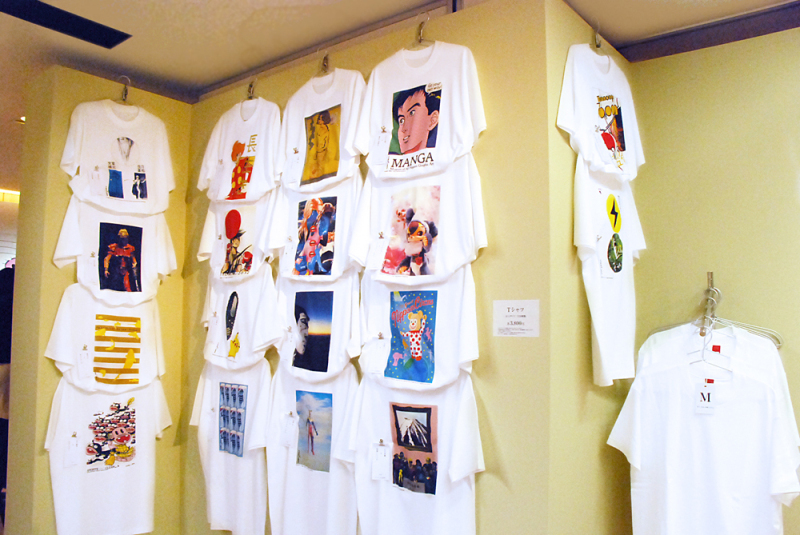 Poster, book, postcards and T-shirts will be available in the exhibition. Will report more details soon. Gamefreak Pokemon game planners : Matsumiya-san denied to go to Houen Region in B2W2 according to his twitter as of 11 March 2012. Meaning : "As one of Pokemon fans, I feel that it's meaningless to go Housen region in B2W2, even exclude words "Ruby Sapphire" in B2W2 title." This tweet reacted to rumors : seems there is piece of ruby and sapphire in the B2W2 logo. 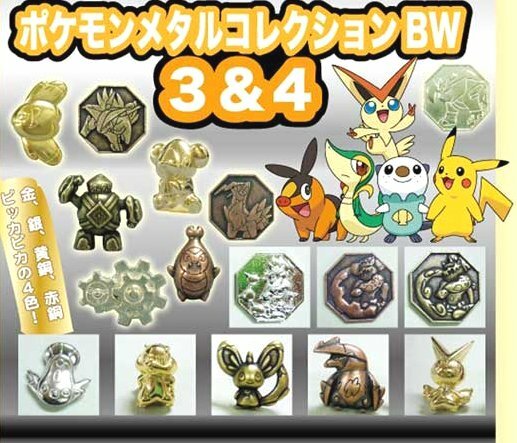 Pokemon fans in the world are eager for the some more B2W2 info day by day. Toshinobu MATSUMIYA, one of Pokemon game planners (setting scenario and character) in Gamefreak. According to MATSUMIYA-san's recently tweet, there is one suggestion on upcoming info. 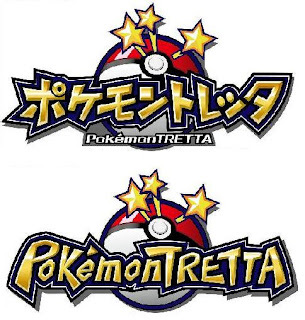 Meaning : "As for Pokemon Black 2 White 2, my understanding is many info will be revealed around 15 April. Hoping it will meet your high expectation." 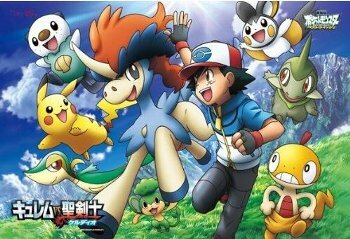 It remind us that CoroCoro May magazine will be published on14 April, Pokemon TV show Pokemon Smash will be aired on 15 April. 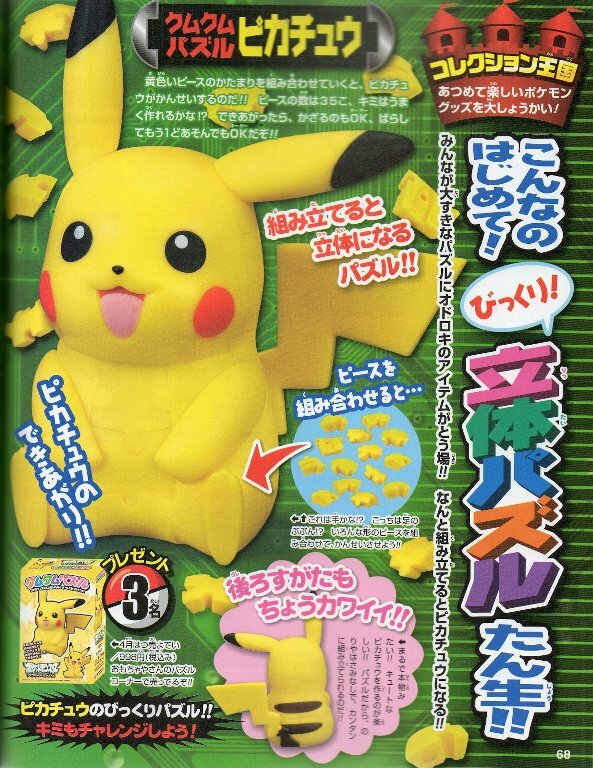 Tomy will release the following Pokemon gimmick plush on 21 April 2012. 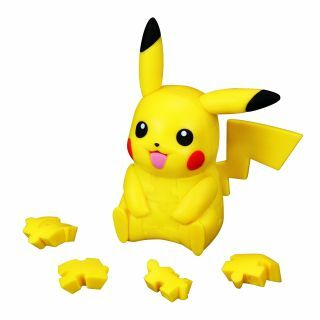 A plush is equipped with sound sensor, plush body turns to the voice or clapping direction, it will smile or joy with body shaking in the turn. 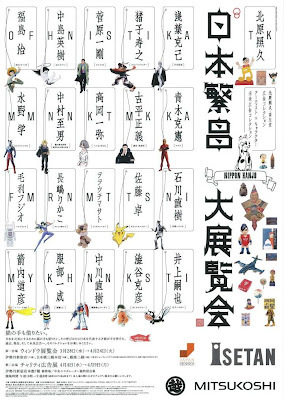 Tomy will release the following Monster Collection figures (MC series) in April/May 2012. Game package art for the new game Pokemon Black 2 and White 2 are revealed in the official site last Thursday. 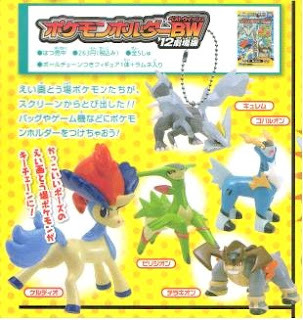 Bandai will release the following Pokemon Kids Keldeo Set in June 2012. AS for #542 Leavanny, it comes in the next BW Kyurem set. 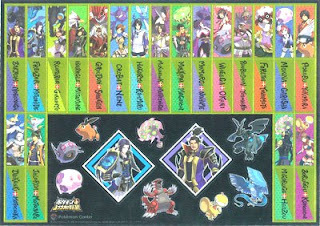 New game Pokemon + Nobunaga's Ambition by Koei is going to be released on 17 March 2012. According to Kouei game produre Hisashi Koinuma's twitter, game director Osamu Mitsueda willl provide the latest info on Nico Live (ゲームのじかん#82), starting 15 March 2012 21:00 JST/15 March 2012 12:00 GMT. 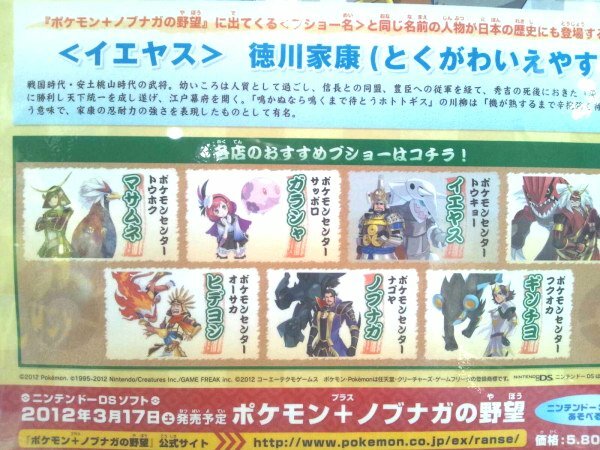 As for new Bushos (Ieyasu イエヤス with Aggron, Masamune マサムネ with Braviary) are confirmed officially at PokeCenJP. 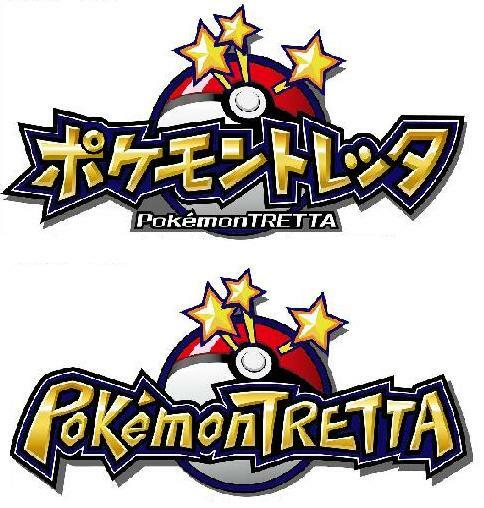 Courtesy of @denkimouse, thanks you for sharing the image. 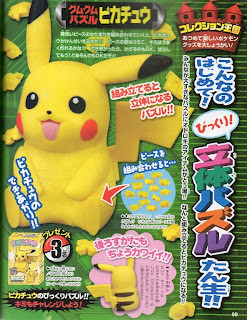 In yesterday's CoroCoro article, added two pages additionally. 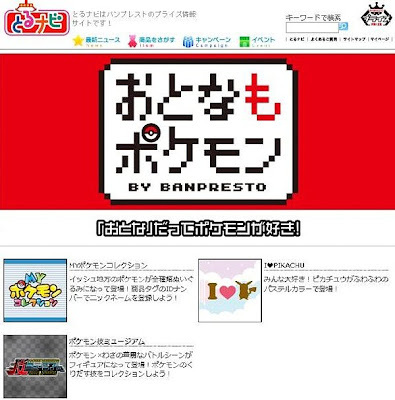 Already some sites report on leaked pages of CoroCoro April magazine, here is re-posting and add one information. The following images are replaced. Announced movie 15 pre-order ticket give-away, it's Keldeo (Lv.15), BW and B2W2 can receive it, starting June 2012, pre-order ticker will sell on 14 April 2012, distribution in the theater is shown as below. Banpresto runs/will run Pokemon game prize series as below at the moment. 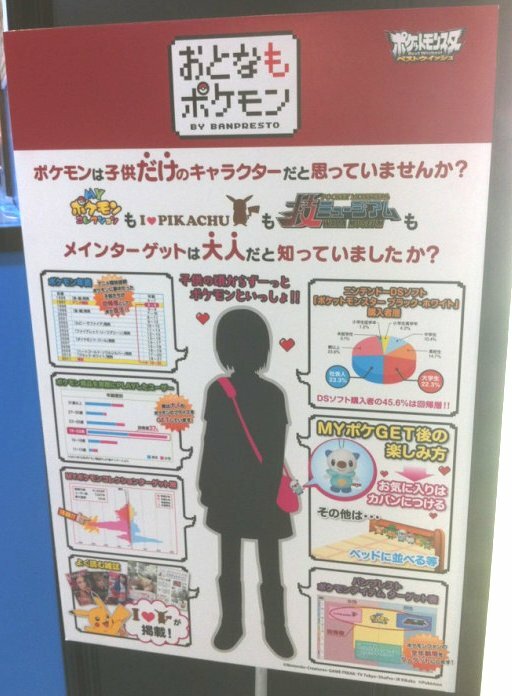 Actually, target of these are for the adults, eye catch copy : 'Pokemon for Grown-Ups おとなもポケモン', marketing concept/background are revealed at AOU#2012. Just opening the related page, special site will be activated in Ju 2012. Thank you for the concept image to Twipic@hide_loopcube. Special thanks to @denkimouse and @happyjolteon. 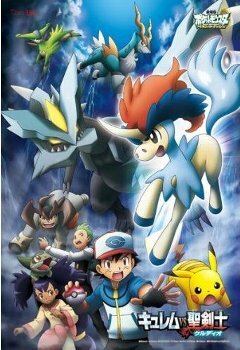 Toho-movie updates the shedule for the upcoming movie latest info in the next week on the media as for Pokemon movie 15 'Kyurem VS The Sacred Swordsman Keldeo'. 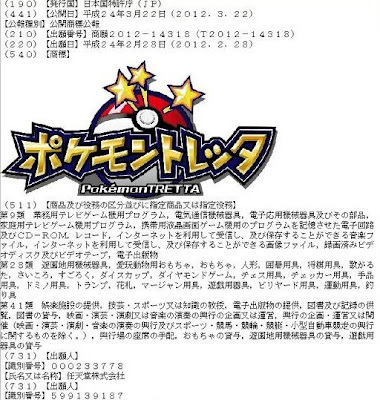 Release schedule of Pokemon Get Collection Candy Figure (TTA) changes to 12 March 2012 from May 2012. Available at the some shops now. Pokemon Battalio, featuring V04 Series. 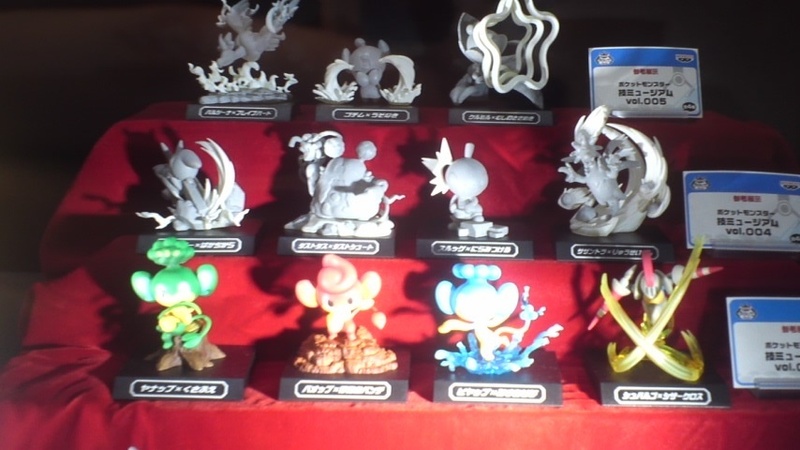 As reported Meloetta plush at Banpresto Expo, 2nd Meloetta plush is additionally confirmed in Pokemon MPC#17. It was covered at AOU#2012, now uncovered. 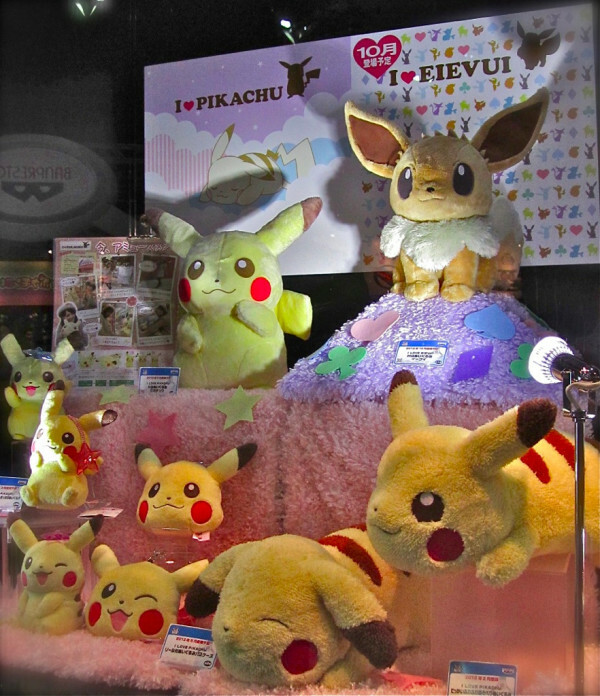 Also updated 'Upcoming Pokemon MPC Plush' master page. Three topics on Pokemon+Nubunaga's Ambition. 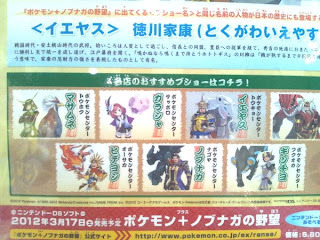 [ 1 ] According to history magazine 'Rekidama' Vol.6, confirmed the following new bushou and Pokemon. Many thank you for the following images to @tikwb. 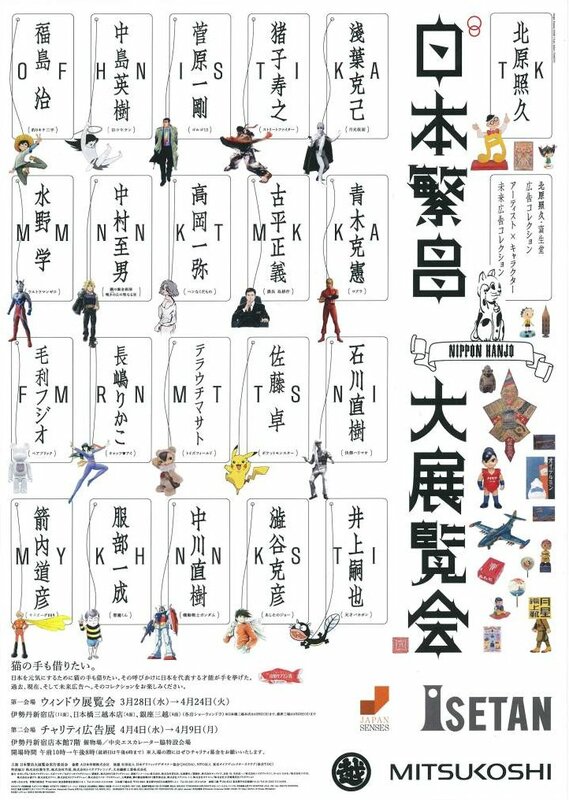 [ 2 ] Dengeki magazine will give away special sticker on Dengeki Festa 2012 on 18 March 2012 at Akihabara Tokyo, Japan. 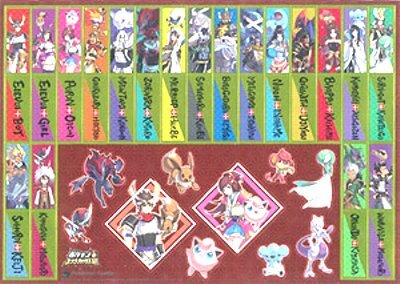 In the sticker, we can see Reshiram. Will hear about Reshiram soon officially. [ 3 ] Ikusa (Battle) in the game video is uploaded today at official channel. 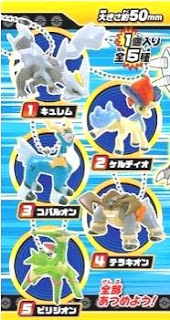 Takara Tomy ARTS will release the following Pokemon Figure Key Chain BW Movie 2012 (ポケモンホルダーBW '12劇場版) on 25 May 2012, candy toys, height 5cm. 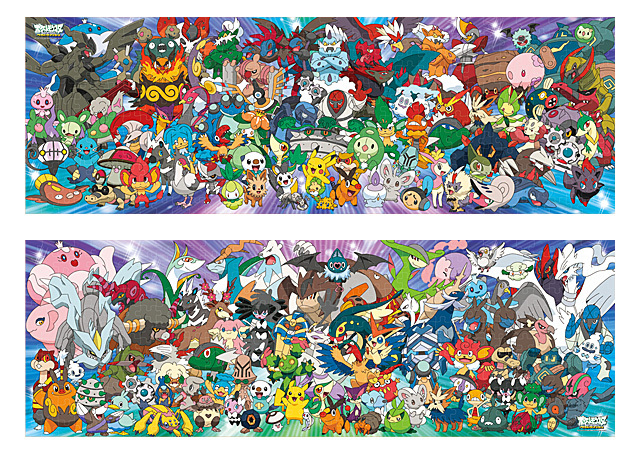 Here is glance of pages of Pokemon Fan Vol.21. No special news for the movie 15 and new game Black 2 and White 2. 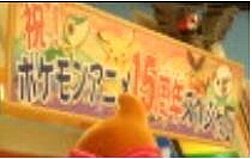 Pokemon Movie 15, page says keyword of new trailer is 'Ice Dragon Gate made by Kyurem'. 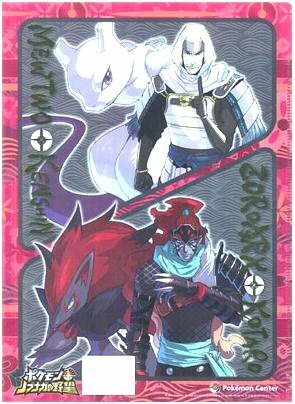 Will upload Nobunaga and Battolio tomorrow. 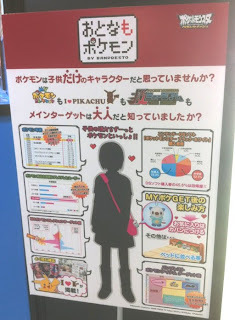 For the promotion of the game 'Pokemon Plus Nobunaga's Ambition', web comic will start on NocoVideo on 16 March 2012. It will be updated every Friday by Launch Nanatsumu. Shouko Nakagawa aka Shokotan is one of main performer in Pokemon TV show PokeSma on Sunday. According to shokotan's blog, something of 15th years anniversary special for Pokemon TV animation has been recorded in TV Tokyo studio on 6 March 2012. On air date of it is not revealed at the moment. Ensky will release the following 3D Jigsaw puzzle on 25 April 2012. 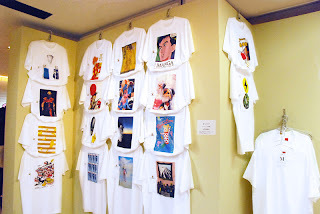 Images of TTA items are uploaded the following articles. 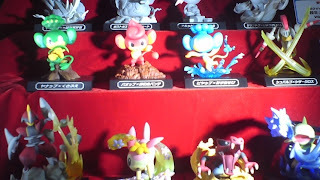 Banpresto Expo was held at Makuharai Chiba, Japan today. Upcoming Pokemon new game prizes are displayed. Here is a clipping from twitters and others. 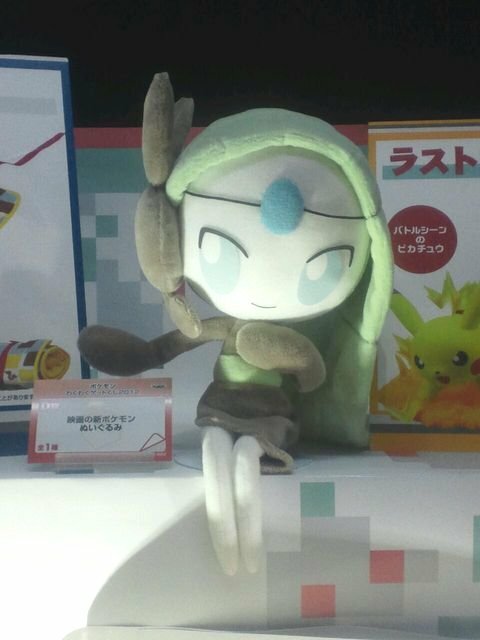 [Updated] Added Meloetta Plush as follow. 2nd one is here. Many thank you for reporting and sharing the images to @sumib_89, @BANPRE_NOW, @coborico and 地獄の九所封. Vol.003 has colors this time. Other images and video in AOU#2012, please see this article. 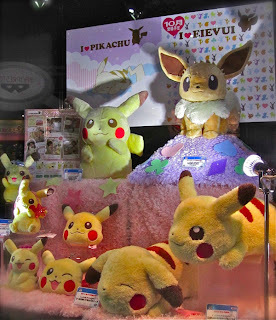 I Love Eevee (EIEVYU) series will start from October 2012. 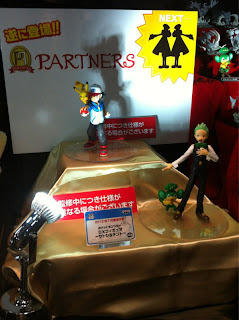 Ash and Cilan (Dento) figures will out in July September 2012, Subway Boss Emmet/Ingo (Nobori/Kudari) will out soon. Lot prize, release schedule is unknown, probably in the mid of July 2012. Again many thanks to @sumib_89, @BANPRE_NOW, @coborico and 地獄の九所封. Thank you for visiting AAPF always. 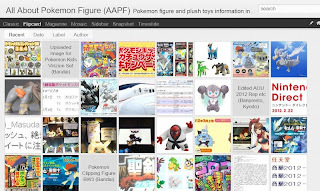 If want to browse the images in AAPF quickly, would recommend to use dynamic view, it's working on AAPF now. Try to click the following screenshots. You can select seven views as you like. Just add /view to our url when you access. Not working yet for smartphone, blogger/google will solve it soon. Image is uploaded to the following article. 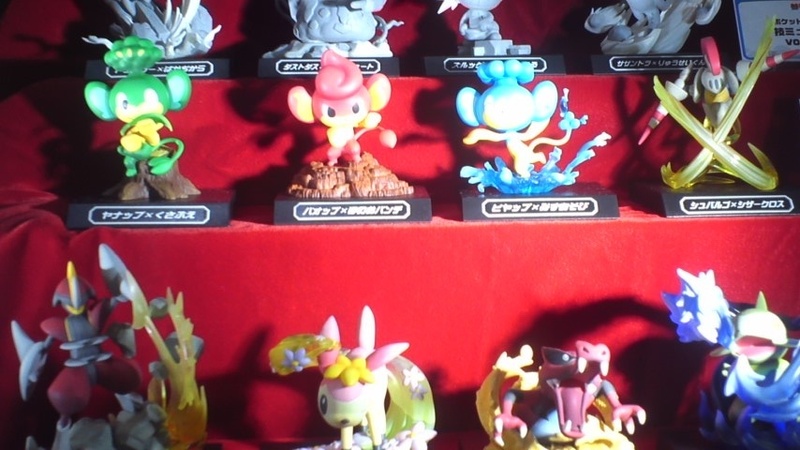 Will upload Pokemon Fan Vol.21 several pages soon, my scanner is out of order now XD. 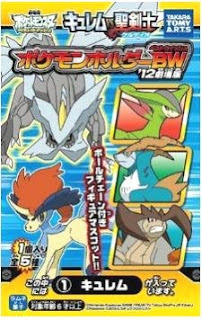 Pokemon Fan Vol.21 (information magazine for anime/movie/merchandise etc) is published from Shougakukan on 3 March 2012. Will upload the scanning pages soon. Next Pokemon Fan Vol.22 will come in April. For the fan of Pokemon plus Nobunaga's Ambition game, the following books will be published from Koei Tecmo Games in March and April 2012.